GALIVANTS FERRY, SC (WMBF) - Asbestos removal, construction and a few new rule changes at Midland Elementary School left some parents wondering what is going on and whether their children would be safe when they head back to school in a few weeks. Concerns were raised by parents, who reached out to WMBF News to look into reports of asbestos at the school. According to South Carolina law, a third party not hired by the construction contractor is required to come in and monitor the air during asbestos removal. The material is harmful when it hits the air, which happens when asbestos is disturbed, usually during construction. "That's when it becomes harmful to us," said Dawn Schoolcraft, an asbestos removal company owner and expert. "We breathe in the fibers and it gets lodged in our lungs and that's when it's known to cause cancer." Schoolcraft is the third party responsible for making sure the asbestos is safely contained and removed at Midland Elementary. She said it was a popular material because of its durability and low price back in previous years. 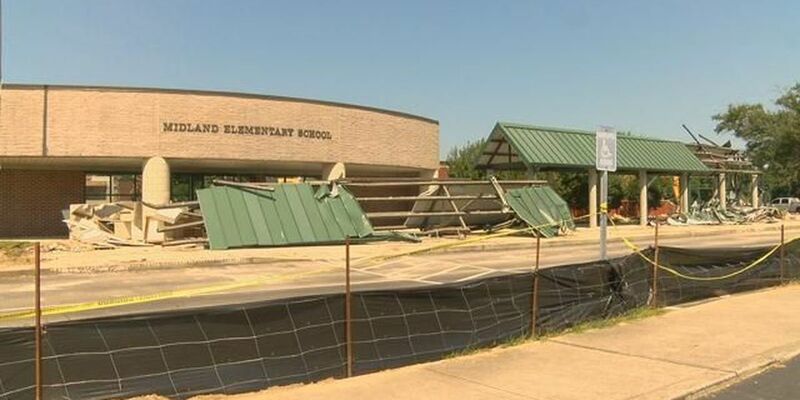 The materials at Midland Elementary are being monitored and most have been removed. Right now, the superintendent for the general contractor said the only asbestos found and still remaining is in the walls backing up to the courtyard of the school. That will be removed this week, and all the debris will be cleaned up by Friday, Aug. 5, in preparation for building the new two-story school. Schoolcraft said asbestos is common in old buildings, which is why it is generally monitored. Leroy Haskins, the superintendent for the general contractor, FBI, said the company gets rid of asbestos by concealing it, isolating it and then taking it away while also monitoring the air. The removal at Midland Elementary will not hurt current students and has not hurt those who have attended the school in the past. "It won't be toxic to any students or staff," Haskins said. Other parents expressed concerns over the extra workers working on the new building. Midland Elementary Principal Jennifer Parker said each worker has had a background check and the work area will be fenced off. Fourth and fifth graders will have school in new portable buildings in the back of the school. While the biggest worry was asbestos, there was also concern over where the students' lunch would come from since there is no cafeteria. Lunches will be delivered every day from Aynor High School. The students' favorites like pizza and wraps will still be available, as they will not be limited to cold meals only. Midland Elementary sent a notice about changes in allowing parents to walk their children to the door of their respective classes. Parker said it has always been an Horry County Schools policy to not allow that, but this year the school will enforce that rule because of construction complications. However, the school will hold an open house for all students and parents, as well as a pre-kindergarten orientation, on Aug. 15. The first day of school is Wednesday, Aug. 17.